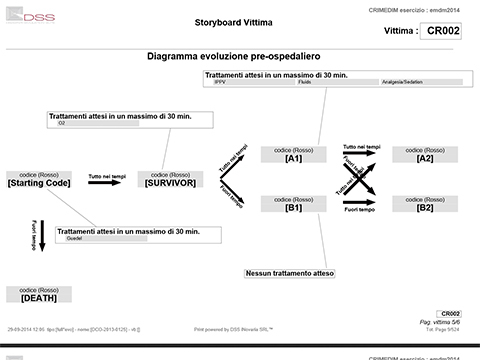 The Disaster Simulation Suite (DSS) is a web-based, semi-quantitative system developed by iNovaria srl in partnership with CRIMEDIM Center of Research in Disaster and Emergency Medicine. It is a multi-dimensional tool, for planning, implementation and evaluating a drill, performing multi-user real time data collection and showing the results in real time. One of the main advantages of the system is that it does not need to be installed but it’s always available on the internet, and it is accessible from a wide variety of devices including smartphones and tablets. The protected hosting server and the hierarchical structure make it a solid, flexible and secure system, while maintaining a simple interface. 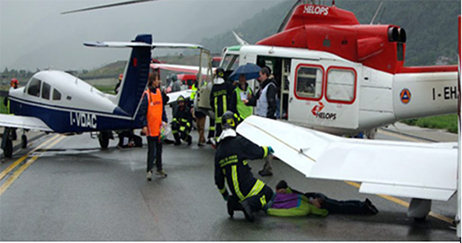 The Disaster Simulation Suite allows the quantitative and qualitative evaluation of Full-scale exercises. 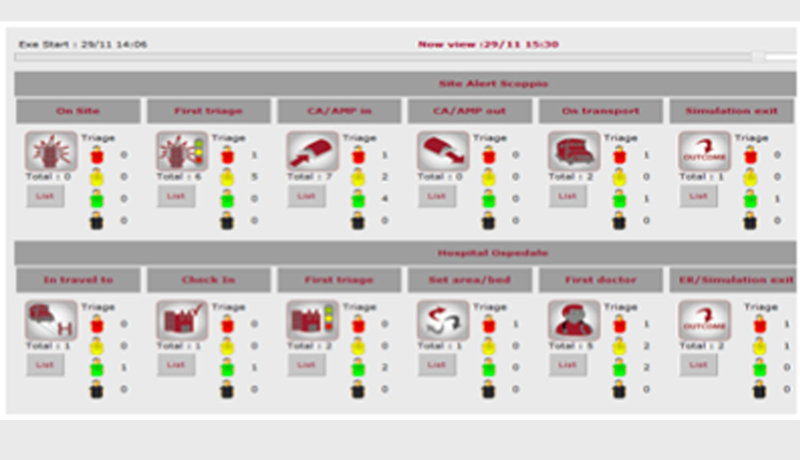 The advantage of the suite is that it allows the creation of events realistic and subsequent collection, aggregation and analysis of performance indicators in dynamic environments and extensive as major emergencies. Specifications DSS is compatible with the international database VictimBase for the creation of the set of victims and with all operating systems (Windows, Mac, Linux,Chrome OS). Case history The DSS was used by "The emergency wing , Israeli Ministry of Health" (Israel) and the Veiligheidsregion Utrecht (Netherlands). 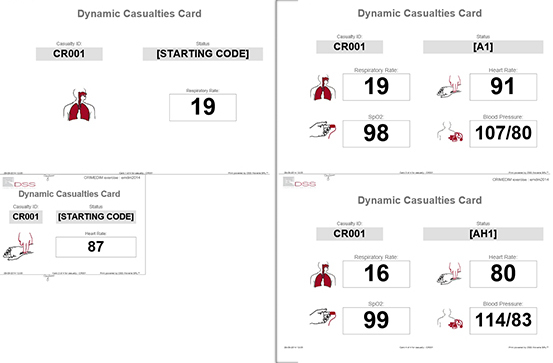 – Cards Pocket 8x10cm to manually collect the key interactions between the victim and operators. 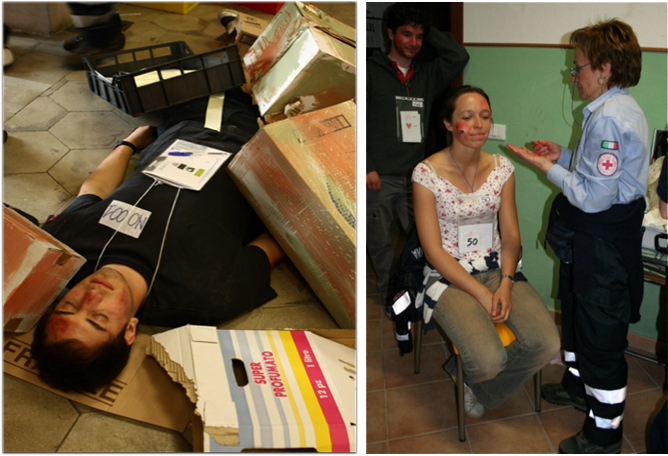 Keep track of actions performed in the course of an exercise is crucial to analyze the events in a second time and to have objective data to be used during the debriefing. This component allows an infinite number of observers to collect key data, such as the execution of orders or the execution of tasks or actions, through any mobile device connected to the Internet, including mobile phones, smartphones and tablets. The performance indicators are based on an extensive scientific literature, but can also be created ad hoc by adapting to specific needs. Allows the analysis and rapid quantitative and qualitative evaluation of the exercise. With the help of charts and graphs dynamically generated, this module allows you to integrate all the data collected during the exercise and generates an objective account for the immediate debriefing or conclusive analysis. 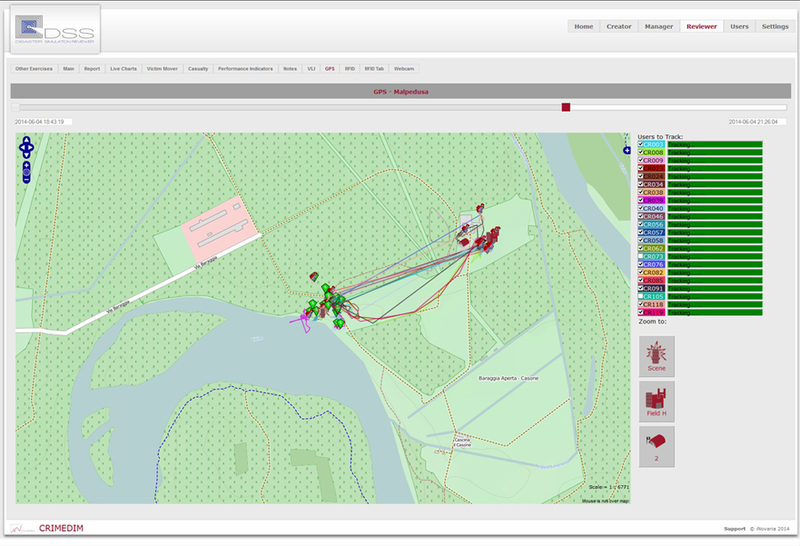 The results of the analysis are stored in a dedicated register, always accessible from any internet-connected device, which can hold an unlimited number of heterogeneous simulations, allowing statistical analysis (including scenarios and comparable between different simulations) and the analysis of efficiency in training, thus ensuring over time quality control of the entire system of crisis response. The system also supports export to the major statistical programs or presentation. It offers the possibility to expand the capacity of data collection with the latest technologies available in the industry. Localization using Radio Frequency Identification (RFID) and / or GPS personnel, vehicles, equipment and victims can be implemented to monitor the positioning of themselves and streams. The antennas can be placed in key areas, such as the Advanced Medical Post or the entrance to the Emergency Department. 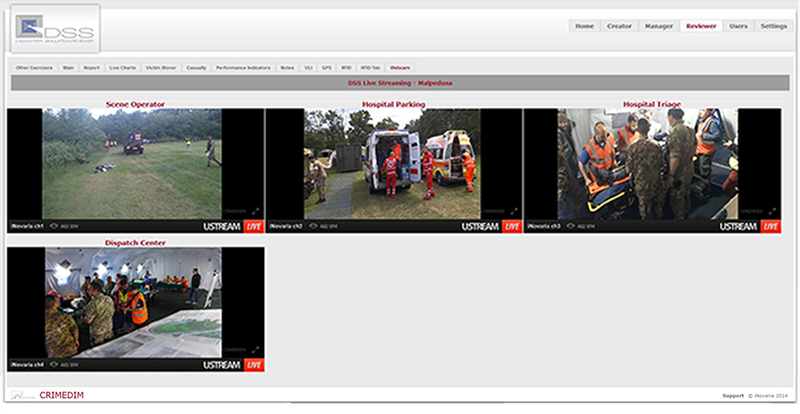 A wide range of webcam give observers a chance to see the operations, save snapshots and play the simulation remotely via a web service broadcasting. 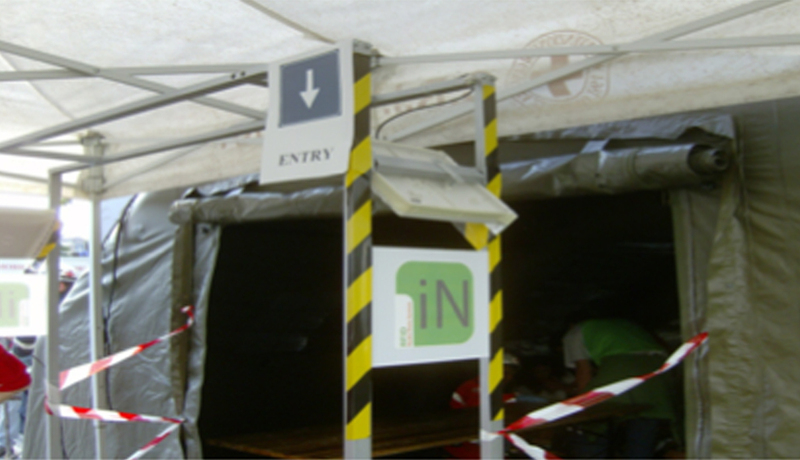 This system can also be used individually, regardless from exercise, especially for monitoring the flow, in order to give a better and more effective response in case of evacuation. Type your message here, we will be happy to help you.